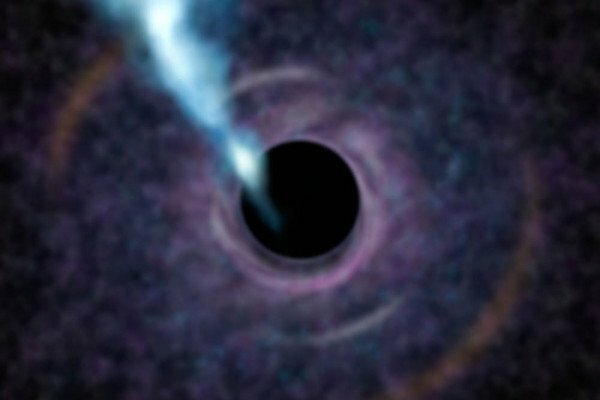 Could black holes be made of dark matter? Part of the show Why don't spiders get stuck on their webs? Can dark matter be the contents of black holes which would then explain the increase in the expansion of the universe speed due to the increase in dark energy? More dark holes result in more dark matter/energy. Andrew - Right. Black holes are these things that we think actually exist in the real universe. At first, they were these kind of theoretical constructions that we thought, if there was so much stuff packed into such a tiny space that gravity got kind of out control, it could get to a point where gravity is so strong that not even light can get away from an object, in the same way that I can't leap off the Earth's surface because I can't get the speed up. You could get to a point where even light couldn't get off the surface of some object. That would then be called a black hole. But almost certainly, they consist of normal matter, so the stuff that you and I made out of that just happens to have come to a bit of a sticky end and ended up in a rather unfortunate part of the universe. There was a time when we thought perhaps we can tie these concepts together. Maybe we know we need all this extra stuff. We know we can have black holes. Black holes are very hard to see because the light can't get out of them. So maybe if we just had lots of little black holes floating around through space, it could account for all that extra stuff that we think we need. But today, we no longer think that that could be the case. The reason is that black holes are not actually quite invisible. There's a very subtle way you can actually see them. Kat:: So, this means that they're not made of dark matter or suddenly we can see dark matter then. Andrew:: It's something like that. Kat:: It must be made of something. Andrew:: The way that you would see them is if a black hole sort of floats in front of a star, say, you're looking at a star and a black hole floats in front then you would momentarily see that star actually get brighter. It might sound like that goes in a wrong direction but the black hole would kind of focus some of the light towards you, almost like a lens. The star would momentarily get brighter. So, if there were all these black holes floating around then when you're staring at a star, you would every now and again see it get a little bit brighter. People have done very careful experiments where they had telescopes really staring at stars. This does not happen. It doesn't happen in the real universe. So we don't think that you can have enough black holes floating around to make up what we need in dark matter. Previous Do brains work better at cold temperatures? Next How far would a paper plane thrown from 35000ft fly? What is at the centre of the Universe? How do you power a spacecraft to Saturn? How big before a fall will kill an animal? Could dark matter be leaked gravity?